Never mind that, over 49 years, the Newport Folk Festival welcomed everyone from Janis Joplin to the Pixies. The performers at this year’s gathering shattered every definition of the idiom. Of course, Newport changed when Bob Dylan plugged in. But if Pete Seeger wanted an axe to cut the electricity on that day in 1965, he would have taken a chainsaw to this year’s lineup. That said, it was a powerful weekend of music. The Minnesota Bard’s spirit was evoked by Jakob Dylan, who joked that his guitar was “acoustic, but plugs in” during an energetic harbor stage set. While Jakob played with a besuited band (that bore a striking resemblance to the crew his dad brought when he last played the festival in 2002), ’68 Newport alum Richie Havens segued from “Maggie’s Farm” into the Who’s “Won’t Get Fooled Again” on the main stage, closing out a well received set. Rain interrupted things in a big way Saturday afternoon, sending many fans home early at the end of Trey Anastasio’s lawn stage set, and forcing others to jostle for space under the harbor stage tent during some of the day’s best music. She & Him, the team of actress Zooey Deschanel (“Elf,” “Live Free Or Die”) and multi-instrumentalist M. Ward, mixes Lulu/Dusty Springfield Brit-pop with Indie-rock sensibilities for a thoroughly original sound. 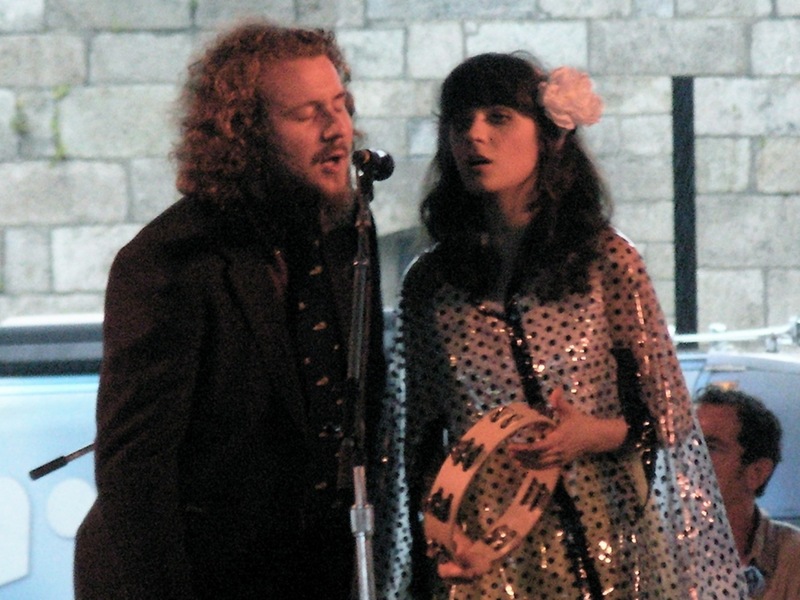 The two shared keyboard duties on the rollicking “This Is Not A Test” after a stellar co-vocal on Ward’s “Magic Trick” from Deschanel and My Morning Jacket’s Jim James. But the beauty of James’s solo set transcended all his stage hopping; the hypnotic “It Beats 4 U” hushed the crowd, while he and Ward’s harmonies on “Wonderful (The Way I Feel)” would have pleased many Simon & Garfunkel fans. James’ spare version of “Golden,” his voice a dead ringer for the “Nashville Skyline” era Dylan (there’s that name again), gave the crowd everything it came for. But Sweet felt the resilience of the American Babies, a Brooklyn band who won the “OurStage” talent contest, provided the festival’s best moment. After a raucous set on the smaller water stage (which hosted several spirited performances, including a mesmerizing one by ukulele master Jake Shimabukuro), the band was drafted as an emergency fill in for Damian and Stephen Marley, who were lost in traffic on the way to the show. Other highlights included a laconic Saturday morning set from Cowboy Junkies, the musical equivalent of the slow food movement. On “Never To Grow Old,” Margo Timmins slouched over the microphone and sang, “I was gonna tell you about my premonition/but I changed my mind and went back to bed,” and no one wondered why. 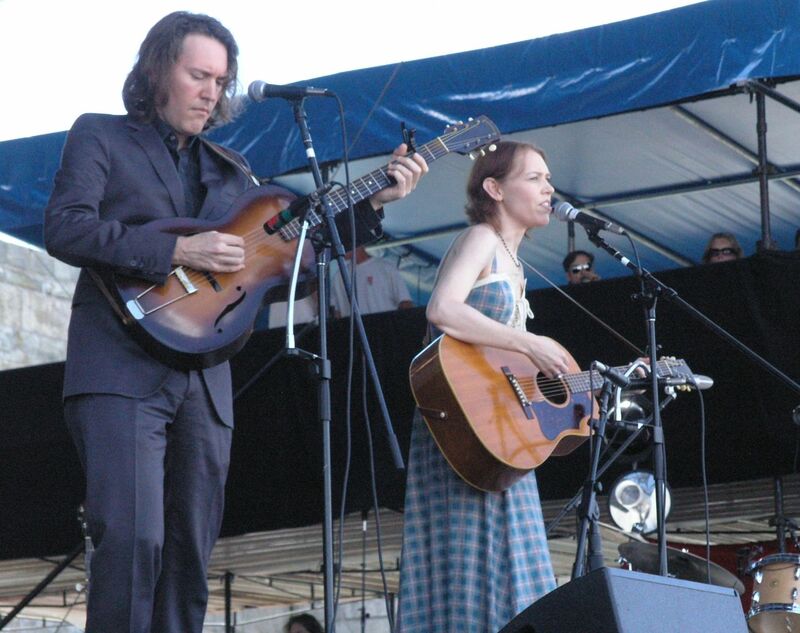 Gillian Welch and David Rawlings did their time-traveling musical prestidigitation to perfection, but would have been better served by trading places in the more intimate harbor tent with Son Volt, whose big sound belonged on the main stage. Welch and Rawlings also joined Levon Helm at the end of his performance for “The Weight,” and later sang “Elvis Presley Blues” with Jimmy Buffett, one of the only inspired moments during his tepid, festival closing set. Buffett had teased that his appearance would vary from his usual shtick. 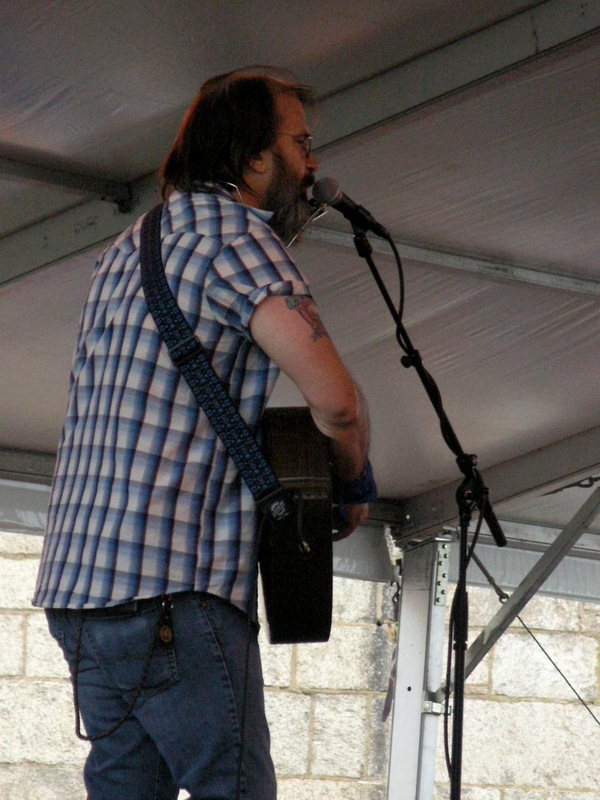 He told the Boston Globe in April that he might bring along just one musician, in a nod to his folk music roots. But that was all a memory Sunday. As the crowd bounced around Land Shark Beer beach balls (a brand he made sure to name-check during “It’s 5 O’clock Somewhere”), Buffett shoehorned local Newport landmarks into the same songs he regionalizes for every Coral Reefer Band show. The band, nine members strong (only the horn section had the night off), played along dutifully. Welch and Rawlings, it should be noted, delighted in every second on stage with Buffett. But when they left, many in the crowd followed, sensing no more surprises. 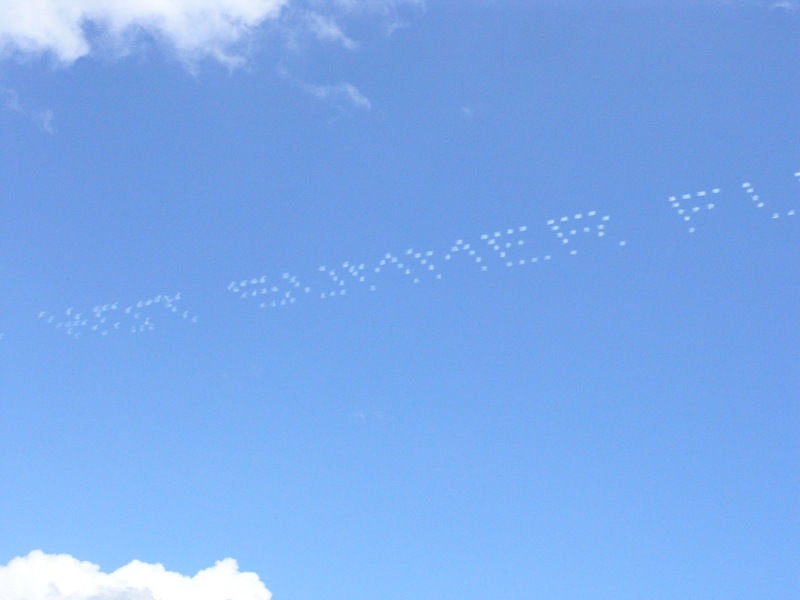 Earlier in the day, a skywriter spelled out the name of a Connecticut casino where Buffett recently opened a restaurant. The pilot apparently had two customers – a plug for an insurance company immediately followed. “HOT SUMMER FUN AT MOHEGAN SUN,” read the words, and as they dissipated, “GEICO GEICO GEICO” – a sad corporate haiku totally at odds with the day’s mood, and Newport’s storied history. Fortunately, the rest of the weekend was nothing like that one bit of hackery. Listen to audio streams of Newport sets on npr.org, which is also offering most of the performances as free podcasts for download on iTunes.